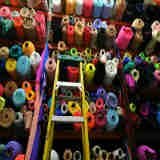 We are Chicago's source for wholesale fabrics, trims, elastics, and corset supplies. We carry a full line of fashion, apparel and special event fabrics. >You can now buy our wholesale fabrics easily online without being a registered business or organization. >Our Wholesale Fabric selections have a low yardage minimums. Great prices and superior quality. >Wholesale fabric by the bolt purchasing is open to small designers, churches, schools, businesses, and the public. >Some fabrics wholesale orders may take up to 2 weeks to ship, for exact ETA please call warehouse at 847-864-1270. >Please allow a 1% to 2% mill shortage on posted yardages. >It is customary and usual to run across thread changes, seams or occasional spots and or stains on full roll yardages. No allowances will be made due to these issues. If you wish to not have these issues we recommend you buy yardage in a retail way and the fabrics will be hand measured and inspected. All flaws and stains will be cut out. This, however, will lead to several pieces of various lengths to complete your order. >Fabric rolls may have been spliced together at mill. If you have concerns, please make note in the customer notes box of the checkout. >20% restocking fee applies to wholesale returns.